Sweat trickling in whole part of body as result of hot taste of red chilli it is said makes healthy body. But, hopes precautions. If non held up with hot taste doesn't dabbl oseng-oseng crackers. Your stomach can thus stomachache and a more regular to backroom. Seen from its(the performa oseng-oseng possible crackers at all lose looks. Especially because this dish only consisted of little cutting of kikil, gajih, and cow hide, having gravy a few with red chilli slices here and there. If we hushed the dish just only, ngendal will surely, viscid because congelation oil from gajih-gajih. But let us is all appearance exhaust as it is that. Now ordered then feels. You kelimpungan will surely, not merely because his(its hot is but also its(the settled cookery taste, delicious, and invites appetite. Its(the reality not once just we try it. Many times, even although one of the friend we express kapok at the end of one's rope because hot. Enunciated, one of favorite cookery in Jogja always meddles red cayenne until 4 kilogram each time ripe for 25 – 30 kilograms kikil. Besides having flavour shallot, garlic, ginger, and alpine galanga, cayenne becomes important flavour of oseng-oseng the crackers. 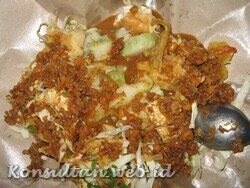 The flavours is made [by] one, fried, then is mixed with kikil, gajih, and cow hide, people ordinary Jogja calls it koyoran. According To Sunarti, owner of booth oseng-oseng crackers, delicacy of its(the cookery because way process it. All flavours is fried, do not be bronze ( fried crucible). Besides, “ Doesn't use merica,” he said. Merica hardly is avoided it, because exactly will change taste and lessens hot appetite of its(the chilli. “ Which its(the name oseng-oseng yes, doesn't use merica, but paprika rawit,” adds it. Exactly by multiplying red cayenne, besides taking care of cookery authenticity, also inspires appetite. Doesn't know why, many mans which was said had do not willing to again enjoys oseng-oseng crackers gara-gara his(its hot taste is remarkable that. But always just they still return to battens hot of oseng-oseng crackers. “ Hot taste of inviting appetite,” says a visitor. Even not rarely they coming often makes bet game: who is at most and resistant eaten oseng-oseng crackers, that is its(the winner. A lot is vexed with this game type. Proven visitor also do not want to in short order bolts from lesehan seat before gaining appetitive hot sajian pot is clean of that. Name of oseng-oseng crackers according to Bu Narti to giving of culture Emha Ainun Najib. “ He giving the name. He/she said, his(its hot taste like crackers, he-he-he,” its(the joke. Other names also is exist; oseng-oseng bledek, thunderbolt, or nylekit. Have been since 30 last year booth residing in Jl. KHA Dahlan ( front of PP Muhammadiyah stripper) that is exist. Vexed with its(the hot taste which ngangeni? Please try. But, prepared towel for fear that sweat mengucur too rapid. Huhah, huhah….